Another one of Sony's flagship VAIO laptops, the Sony VAIO VGN-FW190EBH. The Sony VAIO VGN-FW190EBH is the first of Sony's VAIO laptops to feature a 16.4 inch screen. I guess Sony opted for 16 inch so that users can still view HD movies on their laptop without the additional weight that goes with a 17 inch screen. 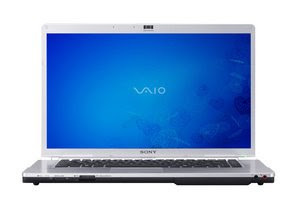 The Sony VAIO VGN-FW190EBH has specifications with HD in mind. Since Sony already won the High Def format wars, it's only natural that they incorporate the technology to everyone of their consumer electronics. The Sony VAIO VGN-FW190EBH's 16.4 inch screen has a 1600x900 screen resolution so that users can enjoy HD movies without the need for an external LCD monitor. However, if you still feel the need to watch your favorite movie on a 40 inch LCD TV, then the Sony VAIO VGN-FW190EBH has an HDMI output so you won't miss out on all the picture details. Also, this VAIO notebook already comes with a Blu-ray disc drive (read-only). The Sony VAIO VGN-FW190EBH is already packed full of features. It has an Intel Core 2 Duo Processor T9400 (2.53 GHz, 6MB L2 Cache), 4GB of installed RAM, ATI Radeon HD 3400 graphics card, BD optical drive, and a spacious 400GB hard disk drive, which if it still isn't enough for you, you can still use any Online Backup software by accessing the internet via Ethernet or Wifi (sorry folks, no WAN). Other input options include: 1 DC-In, 1 Headphone Jack, Microphone Input, 1 Modem Jack, 3 USB 2.0 ports, 1 VGA Output, and an i.LINK Connection. The Sony VAIO VGN-FW190EBH also has a built-in 1.3 megapixel camera. Estimated retail price of the Sony VAIO VGN-FW190EBH is $1769.99. Host your Image or Not?